Like it or not, Valentine’s Day is just around the corner. This Sunday to be exact. And whether you’re shopping for her, shopping for him, or just looking to celebrate your individualism, finding the perfect gift can be tough. Cigar enthusiasts can be easy to buy for, if you have the right information. There are countless sticks and cigar accessories available in almost every price range. But maybe cigar-related gifts are a bit too predictable, or maybe you just want to give that cigar fan something a little different this year. So, instead, below are three unique ideas that the average cigar enthusiast would love. Chocolate-infused bacon. Vosges, a Chicago-based purveyor of sweet treats, carries a line of yummies that combine chocolate and applewood smoked bacon (pictured). From chocolate bars and toffees to a pancake mix and a flying pig, these delicacies are a manly take on a traditional Valentine’s day gift. Prices range from $2.50 to $62. French press gift set. Coffee is widely considered to be a cigar complement, and no self-respecting coffee drinker should be without a French press. This method is preferred by many “brothers of the bean” because it is said to capture more flavor and more oils in each brew. This gift set includes a French press and two insulated highball glasses for only $40. Mad Men-esque barware. Even if you don’t watch Mad Men, you can’t deny that vintage barware is pretty badass. So you’ll be pleased to learn that a Virginia-based retailer has created a line of drinking accessories inspired by the popular AMC drama. Included are flasks, travelling bar sets, muddlers, and classic roly poly glasses. Prices vary. Hopefully these unique gift ideas make it easier to get through what many consider to be a crummy holiday. Good luck, and happy shopping. 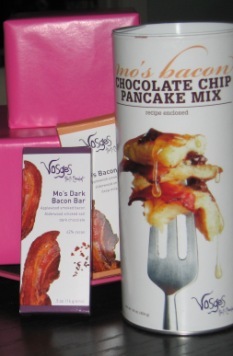 That bacon pancake mix sounds interesting… sort like taking the McGriddle one step further!